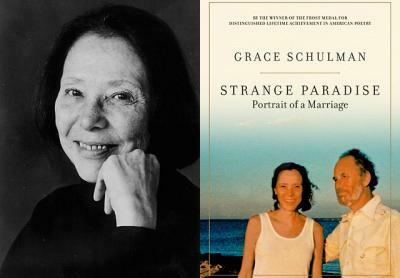 Acclaimed poet Grace Schulman shares insights from her memoir, Strange Paradise: Portrait of a Marriage. Grace Schulman is an award-winning poet and the author of seven collections of poems. She has had long posts as Poetry Editor of the Nation magazine, Director of the Poetry Center at the 92nd Street Y, and Distinguished Professor at CUNY’s Baruch College, where she still teaches. But her love for her scientist husband and her care for him through his long illness proved to be among her greatest inspirations. It called forth her deepest grief at his loss. How did Schulman maintain the independence, solitude, and freedom she required within the bounds of marriage? And what made her marriage endure through a decade of living apart? “In my experience, the phrase ‘happy marriage’ is a term of opposites, like ‘friendly fire’ or ‘famous poet.’ My marriage has been a feast of contradiction . . . ” Strange Paradise looks at this, Schulman’s remarkable career, her friendships with great writers, her work as an historic impresario at the Y, her religious and philosophical leanings, and her grand love affair with New York―all in her magical prose. Grace Schulman received the 2016 Frost Medal for Distinguished Lifetime Achievement in American Poetry, awarded by the Poetry Society of America, and has recently been elected to the American Academy of Arts and Letters. Her new memoir is Strange Paradise: Portrait of a Marriage (Turtle Point Press). Her seventh collection of poems is Without a Claim, (Mariner, Houghton Mifflin Harcourt). Her collection of essays is First Loves and Other Adventures. Among her other honors are the Aiken Taylor Award for poetry, the Delmore Schwartz Memorial Award, a Guggenheim Fellowship, New York University's Distinguished Alumni Award, and a Fellowship from the New York Foundation for the Arts. She has won five Pushcart Prizes and has been featured seven times on Poetry Daily. About her poems, Harold Bloom has written, "Grace Schulman has developed into one of the permanent poets of her generation." Editor of The Poems of Marianne Moore (Viking, 2003), she is Distinguished Professor of English at Baruch College, C.U.N.Y. Schulman is former director of the Poetry Center, 92nd Street Y, 1974-84, and former poetry editor of The Nation, 1971-2006. She lives in New York City and East Hampton, N. Y.